A region aims for prosperity amid mountains, forest and ocean. he Pacific Mountain Alliance for Innovation, created by leaders of a five-county region in the state's thumb of land south and west of Seattle, has been making its share of economic development noise. Recent projects include a US$40-million, 50-job biodiesel plant from Imperium Renewables in Grays Harbor, a 51-job expansion from wood products firm Paneltech International in Hoquiam and growing yacht-building operations from Westport Shipbuilding in both Westport and Hoquiam. The 7,000-sq.-mile (18,130-sq.-km.) region's leaders also have earned a $5-million Workforce Innovation in Regional Economic Development (WIRED) grant from the U.S. Dept. of Labor. Partners in the Alliance include the South Sound Manufacturing Alliance, community colleges and the economic development councils of Grays Harbor, Lewis, Mason, Pacific and Thurston counties. The WIRED grant followed the 2006 award of $4 million in training assistance to the Alliance from the Washington Employment Security Department. Involved in both sides of the Pacific Mountain economic development story is Rick Hole, plant manager for Massachusetts-based agricultural cooperative Ocean Spray, who also sits on the region's workforce development board. The company is in the midst of overlapping cranberry product plant expansions at its complex in Markham, just a short drive from where many of the company's 115 Washington-based growers harvest their berries each fall, as they have done since the earliest days of 20th century. 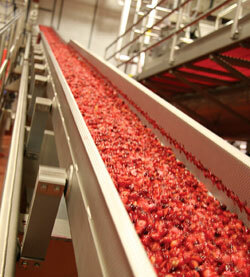 What began with the installation of a $9.9-million juice extraction system in early 2006 quickly grew with the addition of a $17.8-million, 25-job line (above) for production of Craisins. The company is increasing capacity for Craisins nationwide, including a recently announced expansion in Wisconsin Rapids, Wis., that encompasses two 15-million-pound lines coming online in 2008 and 2009, and another new line in Middleboro, Mass. Craisins tripled in sales between 2003 and 2006. Demand for the company's sweetened dried cranberries as an ingredient has also spiked, with the berries featured in more than 1,000 products worldwide. All told, the cooperative includes some 640 owner/growers in Washington, Oregon, Wisconsin, Massachusetts, New Jersey, British Columbia and Québec. Hole says the total investment in Markham has now approached $37 million with the recent decision to put in place a retail packaging system. "Growth has been so spectacular that we're adding volume at 15 million pounds about every 12 months," says Hole. "We're going to run about 500,000 barrels through this plant, about a tenth of the national crop," he says, explaining that most of the feedstock for the plant comes in from Long Beach, Wash.; Bandon, Ore., and B.C. Some of the product comes in frozen, from the network of half a dozen freezers Ocean Spray maintains on the West Coast. But Hole says freezer space usage has dwindled over the years, as Ocean Spray focuses more on running fresh berries into concentrate. Ocean Spray's site selection process centers on finding a balance between the geographic distribution of its owner/growers and its customer demand. "The limiting factor, of course, is where the cranberries are," says Hole. Since it's natural to want to move frozen unprocessed fruit less distance than dried cranberries, Ocean Spray has tended to place operations close to growing areas. He says Ocean Spray was able to avail itself of some of the new training grant money when it added 60 people in Markham. He says skills development for the next generation of millwrights, mechanics, electricians and machine operators is high on his priority list. Echoing a complaint of the National Association of Manufacturers, Hole says, "Nobody understands manufacturing anymore." So the WIRED grant's main use may be to sew that understanding into the fabric of the community via closer integration with the education system. Hole says the environment for industry in the area includes reasonably priced electricity, "all sorts of industrial water" in Aberdeen, rail service and a deepwater port. The area is served by four-lane highway coming in from the I-5 corridor less than an hour away, as well as a shortline railroad. Hole says local offficials have been focusing on the need to ensure there is land available for industrial expansion. The state legislature has helped to streamline permitting, he says. Hole describes the area economy as diversifying, but still tied to natural resources, from fish to berries to timber. "I think the WIRED grant will not only help education," he says, "but help us focus on how we build sustainable industry around this great resource base we have."